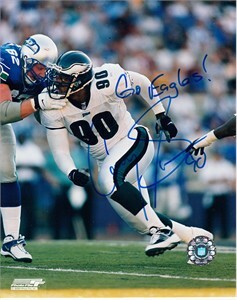 Home»Sports Autographs»Retired Football Player Autographs»Corey Simon autographed Philadelphia Eagles 8x10 photo inscribed Go Eagles! Philadelphia Eagles 8x10 photo autographed in blue Sharpie by former star defensive tackle Corey Simon and inscribe Go Eagles! Photo has minor to moderate handling flaws and wear. Obtained in person. With certificate of authenticity from AutographsForSale.com. ONLY 2 LEFT.